ASU awarded a $20 million grant by NGA to launch the Foresight Initiative to provide interconnected tools, techniques and environments for decision making for increased global sustainability and resilience. ASU awarded a $20 million grant by NGA to launch the Foresight Initiative to provide interconnected tools, techniques and environments for decision making for increased global sustainability and resilence. This innovative research initiative will develop solutions and be a catalyst for the critical and creative thinking needed to address the complex challenges that come with climate change. Arizona State University (ASU) was selected for a competitive five-year award of $20 million by the National Geospatial-Intelligence Agency (NGA) to launch a research partnership, effective June 1, 2014, to explore approaches for anticipating and mitigating national security risks associated with climate change. Known as the Foresight Initiative, the cooperative agreement venture will explore how the effects of climate change on resources, such as water, food, and energy, could contribute to political unrest and instability and gain insights to sustainability and resilience strategies for mitigating the effects. This initiative will play a key role in collaborative research efforts to accelerate the evolution of Activity-Based Intelligence addressing system level activities, dynamics, and interdependent network effects in the context of global climate risks to water security. This multi-year research partnership leverages ASU expertise and thought leadership in visual analytics, complex modeling, and transdisciplinary decision making evolving from years of internal and external investments at ASU. Leveraging computing and system modeling initiatives at ASU and partner organizations, the Foresight Initiative will apply ubiquitous cloud computing and storage technologies, advances in natural user interfaces, and machine learning to address unique geospatial data handling and visual analytic challenges driven by the volume and character of future persistent data flows. The resulting capabilities will allow analysts and decision makers to dynamically interact with diverse data sets in a real-time modeling and simulation environment. This will help them assess the effectiveness of plans, policies, and decisions; discover second- and third-order causal relationships; and understand spatial and temporal patterns that reveal non-obvious underlying interconnections and dependencies. Key areas at ASU that will be integral to this work include the Julie Ann Wrigley Global Institute of Sustainability, Ira A. Fulton Schools of Engineering, College of Liberal Arts and Sciences, College of Public Programs, Decision Theater Network, and Decision Center for a Desert City. 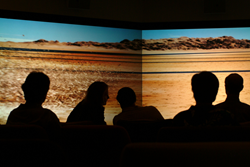 For example, ASU’s Decision Theater provides advanced modeling and simulation that allows diverse groups of stakeholders to visualize large amounts of data, policy parameters, and environmental uncertainties on panoramic HD displays. Scientists, analysts, and decision makers can easily interact in real-time to tweak the rules and data sets to account for new insights and deeper understanding of relationships, providing a range of outcomes based on the changes. This allows for more effective decision making among people from different backgrounds.